Fight the Napoleonic Wars all over again. Some people just like to wage war. 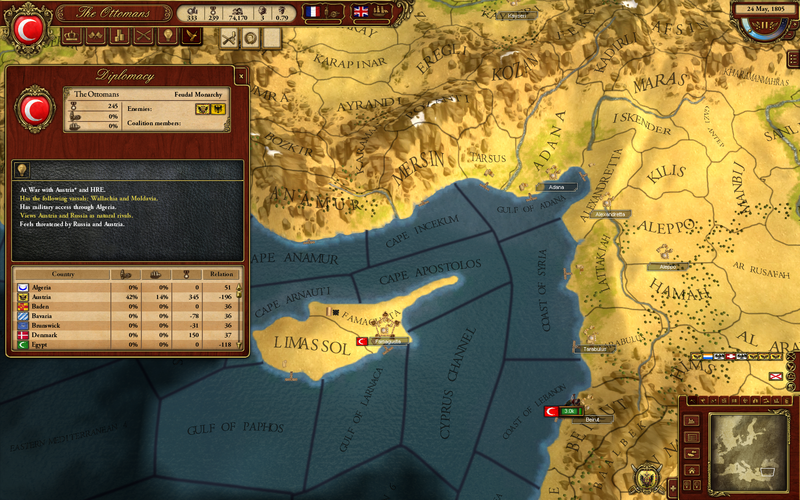 In Paradox Interactive's flagship series, Europa Universalis or last year's Crusader Kings II, there are many aspects to consider in running an empire like trade and diplomacy, and the players who just like to blow stuff up might be a little bored with all that. 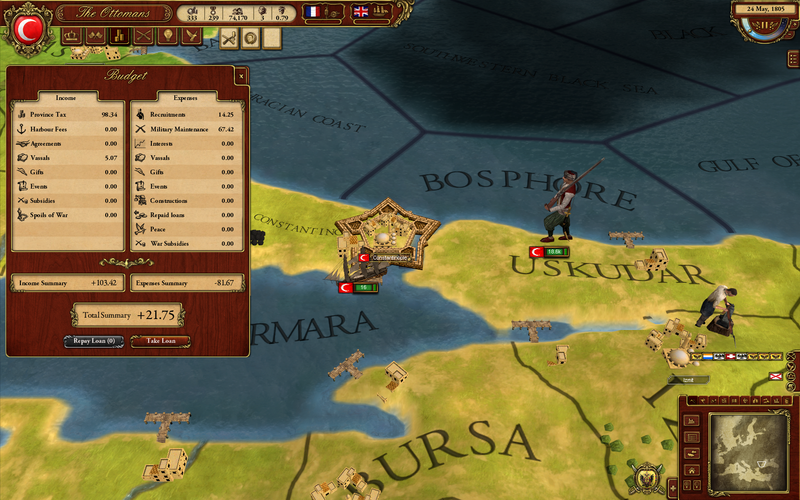 Paradox's upcoming offering for the warmongers is March of the Eagles, a distillation of the military aspects of Europa Universalis set in the ten years of the Napoleonic Wars in Europe. For a history buff, and a fan of board games set in that era, it was fun to play such a refreshingly focused strategic war game. The best part? 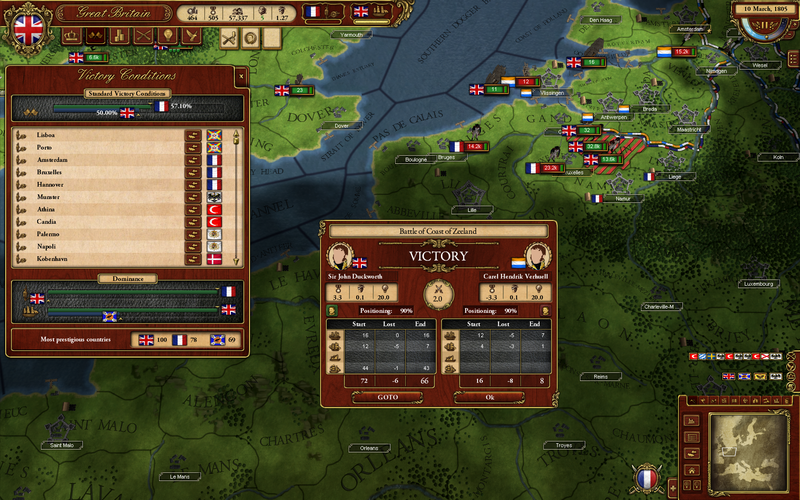 Unlike Europa Universalis, you can actually win or lose March of the Eagles. At the invitation of Paradox Development Studios, I got to tickle the keyboard and mouse with a beta build of March of the Eagles. This was no hands off, let-the-developer-show-you-the-neat-little-fiddley-bits demonstration. Chris King from Paradox Development Studio just let me play the game. I picked the middle-ground Prussians, avoiding the major powers of England and France, but still able to win the game on my own merits. Aside from a few unique units, the major difference between the big nations is their objectives and the strategic position on the map, which is a major consideration. I could have picked any one of the many smaller states like Hanover or Mecklenberg, but their only goal is to make sure they are on the winning side at the game's end. "The historical precedence for this is Saxony, which switched sides on the second day of the battle of Leipzig," King told me. "They actually walked over and turned on Napoleon. We tried to set up that kind of tension in the game." Each of the major powers has 7 land provinces and 7 coastal provinces that you need to control to win when the clock reaches 1815. For example, Prussia needed two provinces controlled by Mecklenberg so it made sense to declare war on them first. 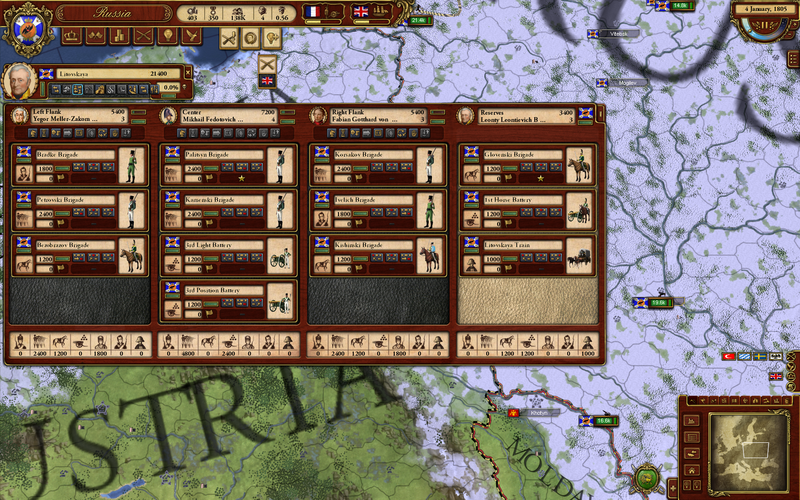 Once I occupied them and annexed Mecklenberg, it became Prussian territory and my land dominance score rose. Prussia was on its way towards challenging France, but I also needed to make sure Napoleon held less than 7 of his land objectives. 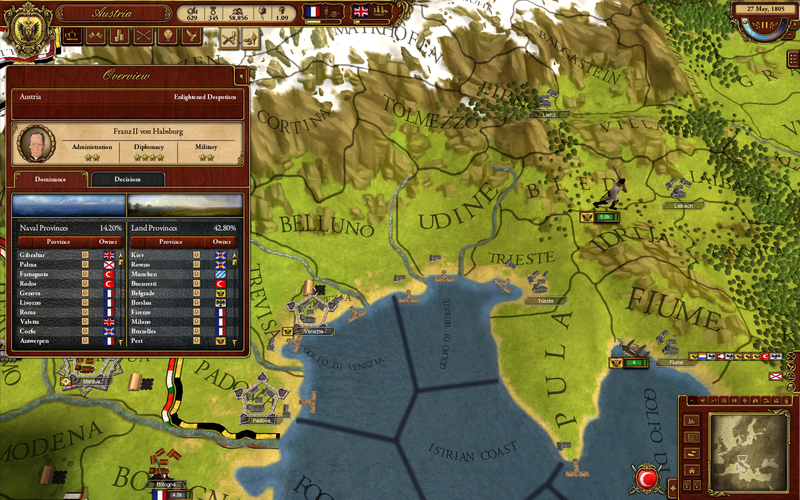 Focusing the game on holding and capturing specific provinces instead of overall conquest made for some intense decision-making. It was definitely fun to try to determine when to strike, balancing patience against allowing your enemies to gain too much of an edge. Many of the mechanics work exactly like EU. The game is played in "pausable real-time" - meaning you can fast forward time as quickly as you want but you always have the option to stop and consider your next moves. 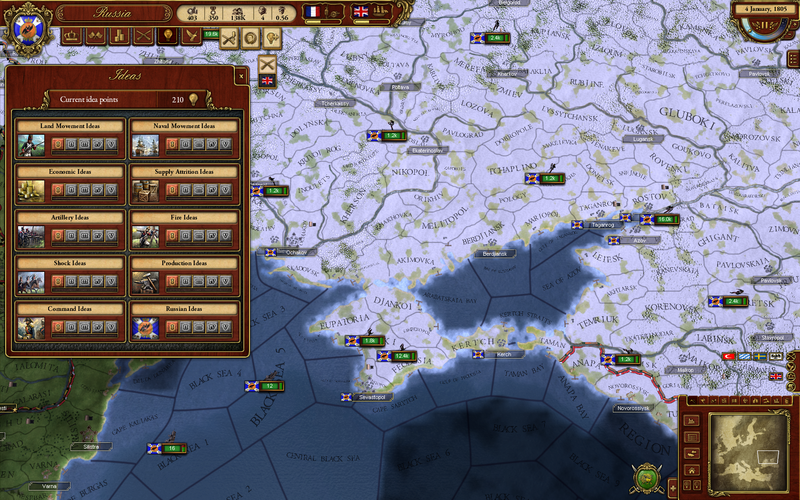 You levy troops by clicking on provinces and picking a cavalry unit or a piece of artillery to train. There are a huge number of options from the start and you have to balance costs versus training time versus available manpower. Each nation has a set value called manpower which represents the military age population, and it slowly grows over time. If your armies are quickly depleted because, say, you brazenly declared war on France like I did, it will take a long time for you to remobilize your forces. The differences to the design from EU all serve to focus the action on a military campaign. Instead of a complex technology tree, you only have military ideas and these are purchased using idea points. You gain the currency slowly over time, and you also gain idea points through fighting battles, but it's cool that you actually gain more when you lose a battle. 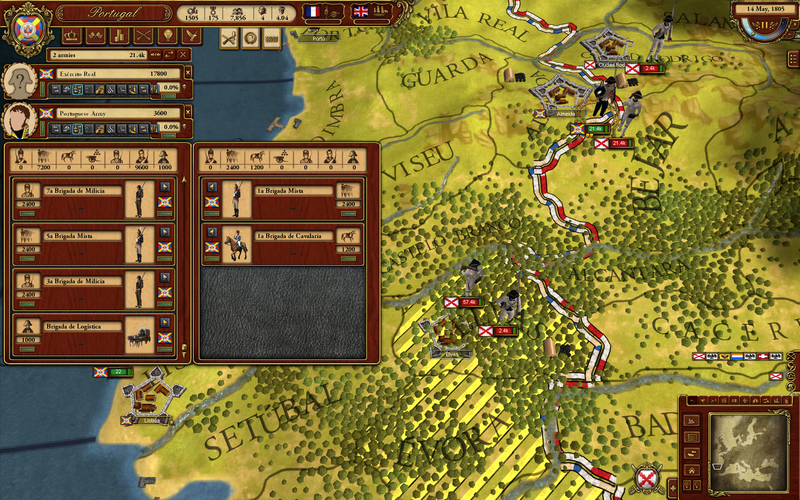 That way even in defeat you can improve your army with abilities like quicker marching or tactical bonuses. Speaking of tactics, March of the Eagles definitely rewards combined arms though specific bonuses you only get through having the requisite number of regiments in the flanks of your army. Other than that though, battles are only fought by watching numbers tick up or down - March of the Eagles is definitely a strategic-level game. As I mentioned earlier, Prussia perhaps was a little too aggressive in declaring war on France in the game I played last week. Maybe I should have listened to Chris King's warnings, since he helped design the game after all. The might of Napoleon quickly rose up and thwarted the great Prussian invasion of the French homeland. Sure, I got to besiege Paris, and even assaulted the city and occupied it with Prussian forces, but 60,000 Frenchmen swooped down and quickly liberated the capitol. My army was destroyed, and it was going to take several years to rebuild. But at least my generals were able to sup on rich French cheeses, drink full-bodied French wines and entertain full-bodied French women, if only for a few days. 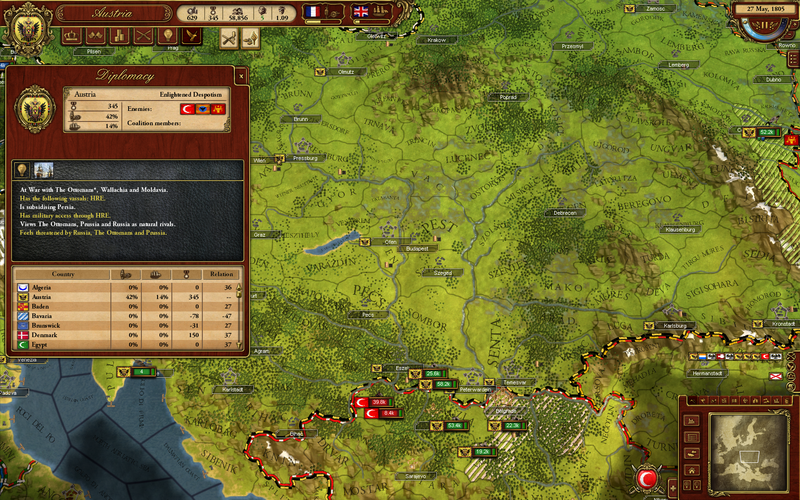 I look forward to picking up March of the Eagles and avenging my Prussian countrymen when it comes out early 2013. If you like the war, but don't care so much about the other parts of grand strategy games, then perhaps you should too.